Decisions, decisions. They can make or break marketing success. 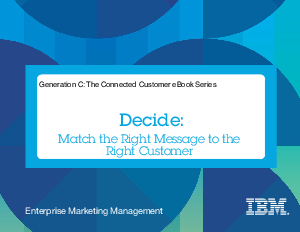 Yet as customers and channels grow more complex, so does decision-making. As choices multiply, marketing becomes more challenging than ever. The days when marketers could rely strictly on good judgment and business acumen are past. Technology for decision and process automation gives marketers a decided edge in making spot-on decisions that match individual customers to the best message, on a scale of millions.